Robots become every day more ‘intelligent’. 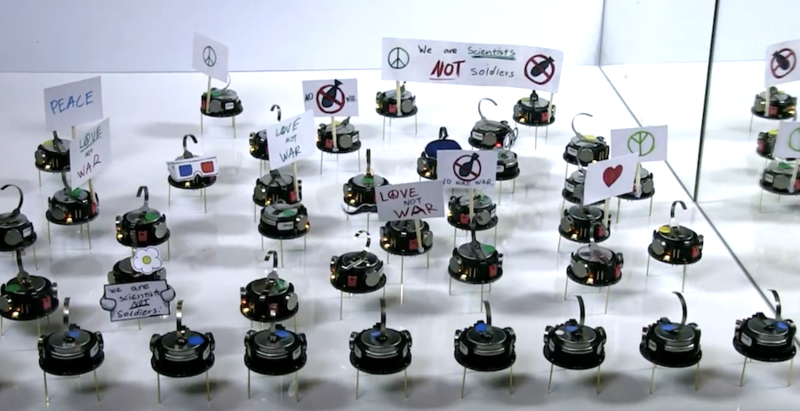 What if robots were intelligent enough to say NO to war? This would be a happier future. This short film is a light-hearted comedy that aims to launch an interesting discussion and motivate reflexion on the killer-robots topic. The fictional scenario describes a future where robots contract out and refuse to be employed in human warfare. This optimistic point of view can be inspirational to engineers and roboticists developing a robotic future. The film features robots as actors on the stage and is the result of a student project between Sheffield Robotics of the University of Sheffield and the Institute of Arts of Sheffield Hallam University. The film has been partially funded by the OnCampUS Placement framework.